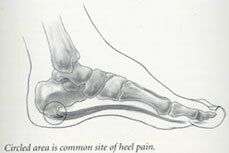 Heel pain is extremely common. It often begins without injury and is felt under the heel, usually while standing or walking. It is usually worst when arising out of bed. Inflammation of the connective tissue on the sole of the foot (plantar fascia) where it attaches to the heel bone is the most common cause of pain. It is often associated with a bony protrusion (heel spur) seen on X-ray studies. Most cases will improve spontaneously. Heat and stretching, medication to reduce swelling of the soft tissues in your foot and shoe inserts are quite helpful. If pain continues, steroid injections or walking casts are used. Only in the most troubling and prolonged cases is surgery recommended. Your podiatrist is a Doctor of Podiatric Medicine (DPM) with extensive training in the treatment of the entire foot and ankle including bones, joints, ligaments, tendons, muscles, and nerves.